This article is about the society of the Mongol Empire. During the Mongol Empire there were two different groups of food, “white foods” and “brown foods” . “White foods” were usually dairy products and were the main food source during the summer. The main part of their diet was “airag” or fermented mare’s milk, a food which is still widely drunken today. The Mongols rarely drank milk fresh, but often used it to create other foods, including cheese and yogurt. “Brown foods” were usually meat and were the main food source during the winter, usually boiled and served with wild garlic or onions. The Mongols had a unique way of slaughtering their animals to get meat. The animal was laid on its back and restrained. Then the butcher would cut its chest open and rip open the aorta, which would cause deadly internal bleeding. Animals would be slaughtered in this fashion because it would keep all of the blood inside of the carcass. Once all of the internal organs were removed, the blood was then drained out and used for sausages. The Mongols also hunted animals as a food source, including rabbit, deer, wild boar, and even wild rodents such as squirrels and marmots. During the winter the Mongols would also go ice fishing. The Mongols rarely slaughtered animals during the summer but if an animal died of natural causes they made sure to carefully preserve it. This was done by cutting the meat into strips and then letting it dry by the sun and the wind. During the winter sheep were the only domestic animal slaughtered, but horses were occasionally slaughtered for ceremonies. Meal etiquette existed only during large gatherings and ceremonies. The meal, usually meat, was cut up into small pieces. Guests were served their meat on skewers and the host determined the order of serving. People of different social classes were assigned to different parts of the meat and it was the responsibility of the server or the “ba’urchis” to know who was in each social class. The meat was eaten with fingers and the grease was wiped on the ground or on clothing. The most commonly imported fare was liquor. Most popular was Chinese rice wine and Turkestani grape wine. Genghis Khan was first presented grape wine in 1204 but he dismissed it as dangerously strong. Drunkenness was common at festivals and gatherings. Singing and dancing were also common after the consumption of alcohol. Due to Turkestani and Middle Eastern influences, noodles started to appear in Mongol food. Spices such as cardamom and other food such as chickpeas and fenugreek seeds also became part of the diet due to these external influences. Mongol “Great Khans” coin, minted at Balkh, Afghanistan, AH 618, 1221 CE. Genghis Khan authorized the use of paper money shortly before his death in 1227. It was backed by precious metals and silk. The Mongols used Chinese silver ingot as a unified money of public account, while circulating paper money in China and coins in the western areas of the empire such as Golden Horde and Chagatai Khanate. Under Ögedei Khan the Mongol government issued paper currency backed by silk reserves and founded a Department which was responsible for destroying old notes. In 1253, Möngke established a Department of Monetary affairs to control the issuance of paper money in order to eliminate the overissue of the currency by Mongol and non-Mongol nobles since the reign of Great Khan Ögedei. His authority established united measure based on sukhe or silver ingot, however, the Mongols allowed their foreign subjects to mint coins in the denominations and use weight they traditionally used. During the reigns of Ögedei, Güyük and Möngke, Mongol coinage increased with gold and silver coinage in Central Asia and copper and silver coins in Caucasus, Iran and southern Russia. The Yuan dynasty under Kublai Khan issued paper money backed by silver, and again banknotes supplemented by cash and copper cash. Marco Polo wrote that the money was made of mulberry bark. The standardization of paper currency allowed the Yuan court to monetize taxes and reduce carrying costs of taxes in goods as did the policy of Möngke Khan. But the forest nations of Siberia and Manchuria still paid their taxes in goods or commodities to the Mongols. Chao was used only within the Yuan dynasty, and even Ilkhan Rinchindorj Gaykhatu, who was supportive of the Yuan leadership in other ways, failed to adopt the monetary experiment in his Middle East realm in 1294. As did the khanates of the Golden Horde and Chagatai Khanate, the Ilkhanate minted their own coins in gold, silver and copper. Ghazan’s fiscal reforms enabled the inauguration of a unified bimetallic currency in the Ilkhanate. Chagatai Khan Kebek renewed the coinage backed by silver reserves and created a unified monetary system through the realm. The Mongols had a strong history of supporting merchants and trade. Genghis Khan had encouraged foreign merchants early in his career, even before uniting the Mongols. Merchants provided him with information about neighboring cultures, served as diplomats and official traders for the Mongols, and were essential for many needed goods, since the Mongols produced little of their own. Mongols sometimes provided capital for merchants, and sent them far afield, in an ortoq (merchant partner) arrangement. As the Empire grew, any merchants or ambassadors with proper documentation and authorization, received protection and sanctuary as they traveled through Mongol realms. Well-traveled and relatively well-maintained roads linked lands from the Mediterranean basin to China, and greatly increasing overland trade, and resulting in some dramatic stories of those who traveled what became known as the Silk Road. One of the best-known travelers from West to East was Marco Polo, and a comparable journey from East to West was that of the Chinese Mongol monk Rabban Bar Sauma, who traveled from his home of Khanbaliq (Beijing) as far as Europe. Missionaries such as William of Rubruck also traveled to the Mongol court, on missions of conversion, or as papal envoys, carrying correspondence between the Pope and the Mongols as attempts were made to form a Franco-Mongol alliance. It was rare though for anyone to travel the entire length of the Silk Road. Instead, traders moved products much like a bucket brigade, with luxury goods being traded from one middleman to another, from China to the West, and resulting in extravagant prices for the trade goods. After Genghis, the merchant partner business continued to flourish under his successors Ögedei and Güyük. Merchants brought clothing, food, and other provisions to the imperial palaces, and in return the Great Khans gave the merchants tax exemptions, and allowed them to use the official relay stations of the Mongol Empire. Merchants also served as tax farmers in China, Russia and Iran. If the merchants were attacked by bandits, losses were made up from the imperial treasury. Policies changed under the Great Khan Möngke. Because of money laundering and overtaxing, he attempted to limit abuses and sent imperial investigators to supervise the ortoq businesses. He decreed all merchants must pay commercial and property taxes, and he paid off all drafts drawn by high-ranking Mongol elites from the merchants. This policy continued in the Yuan dynasty. Möngke-Temür granted the Genoese and the Venetians exclusive rights to hold Caffa and Azov in 1267. The Golden Horde permitted German merchants to trade in all of its territories including Russian principalities in the 1270s. The fall of the Mongol Empire led to the collapse of the political unity along the Silk Road. Also falling victim were the cultural and economic aspects of its unity. Turkic tribes seized the western end of the Silk Road from the decaying Byzantine Empire, and sowed the seeds of a Turkic culture that would later crystallize into the Ottoman Empire under the Sunni faith. Turkic–Mongol military bands in Iran, after some years of chaos were united under the Saffavid tribe, under whom the modern Iranian nation took shape under the Shiite faith. Meanwhile Mongol princes in Central Asia were content with Sunni orthodoxy with decentralized princedoms of the Chagatai, Timurid and Uzbek houses. In the Kypchak–Tatar zone, Mongol khanates all but crumbled under the assaults of the Black Death and the rising power of Muscovy. In the East, the native Chinese overthrew the Yuan dynasty in 1368, launching their own Ming dynasty and pursuing a policy of economic isolationism. The introduction of gunpowder contributed to the fall of the Mongols, as previously conquered tribes used it to reassert their independence. Gunpowder had differing effects depending on the region. In Europe, gunpowder and early modernity lent to the integration of territorial states and increasing mercantilism. Along the Silk Road, it was quite the opposite: failure to maintain the level of integration of the Mongol Empire, and a resulting decline in trade, partially exacerbated by the increase in European maritime trade. By 1400, the Silk Road no longer served as a shipping route for silk. One of the most impressive discoveries that Marco Polo made on his visit to Mongolia is how the empire’s monetary system worked. He was not impressed by the silver Akçe that the empire used for a unified currency, or that some realms of the empire still used local currency, but he was most surprised by the fact that in some parts of the empire the people used paper currency. Marco Polo considered the use of paper currency in the Mongol Empire one of the marvels of the world. Paper currency wasn’t used in all of the empire. 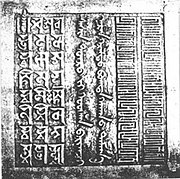 The Chinese silver ingot was accepted as universal currency throughout the empire and other local coins were used in the western part of the kingdom. Paper currency was used in what was China before the Mongols conquered it. The Chinese had mastered the technology of printmaking and therefore it was relatively simple for them to print bills. Paper currency was used in China because in 960 A.D. the Song dynasty started replacing their copper coinage with paper currency. When the Mongols invaded the Song dynasty they started issuing their own Mongolian bills in 1227. This first attempt by the Mongols did not last long because the paper currency was not unified throughout China and they expired after a couple of years. In 1260 Kublai Khan created China’s first unified paper currency with bills that did not have any expiration date. To validate the currency it was fully exchangeable to silver and gold and was accepted as tax payments. Currency distribution was small at first but the war against the Song in South China and Japan made the distribution of the currency increase by 14 fold. With the defeat of the Song, their bills were taken out of circulation and could be exchanged with the current currency with an extraordinary value of 50 to 1. Being the first government to have any sort of paper currency, foreigners understood nothing about it, and some even considered it a form of magic. Regardless of persistent inflation after 1272 paper currency backed by limited releases of coins remained as the standard means of currency until 1345. Around 1345 rebellions, economic crisis and financial mismanagement of the paper currency destroyed the public’s confidence in the bills. Paper money wasn’t extremely easy to adopt because it was a foreign concept in the beginning and it wasn’t a precious metal, it was just a piece of paper. To initiate the transition from other forms of compensation to paper currency the government made refusing to accept the bill punishable by death. To avoid devaluation the penalty for forging or counterfeiting was death as well. Members of the Golden Kin (or Golden Family – Altan urag) were entitled to a share (khubi – хувь) of the benefits of each part of the Mongol Empire just as each Mongol noble and their family, as well as each warrior, was entitled to an appropriate measure of all the goods seized in war. In 1206, Genghis Khan gave large lands with people as share to his family and loyal companions, of whom most were people of common origin. Shares of booty were distributed much more widely. Empresses, princesses and meritorious servants, as well as children of concubines, all received full shares including war prisoners. For example, Kublai called 2 siege engineers from the Ilkhanate in Middle East, then under the rule of his nephew Abaqa. After the Mongol conquest in 1238, the port cities in Crimea paid the Jochids custom duties and the revenues were divided among all Chingisid princes in Mongol Empire accordance with the appanage system. As loyal allies, the Kublaids in East Asia and the Ilkahnids in Persia sent clerics, doctors, artisans, scholars, engineers and administrators to and received revenues from the appanages in each other’s khanates. After Genghis Khan (1206–1227) distributed nomadic grounds and cities in Mongolia and North China to his mother Hoelun, youngest brother Temüge and other members and Chinese districts in Manchuria to his other brothers, Ögedei distributed shares in North China, Khorazm, Transoxiana to the Golden Family, imperial sons in law (khurgen-хүргэн) and notable generals in 1232-1236. Great Khan Möngke divided up shares or appanages in Persia and made redistribution in Central Asia in 1251-1256. Although Chagatai Khanate was the smallest in its size, Chagatai Khans owned Kat and Khiva towns in Khorazm, few cities and villages in Shanxi and Iran in spite of their nomadic grounds in Central Asia. First Ilkhan Hulagu owned 25,000 households of silk-workers in China, valleys in Tibet as well as pastures, animals, men in Mongolia. His descendant Ghazan of Persia sent envoys with precious gifts to Temür Khan of Yuan dynasty to request his great-grandfather’s shares in Great Yuan in 1298. It is claimed that Ghazan received his shares that were not sent since the time of Möngke Khan. Mongol and non-Mongol appanage holders demanded excessive revenues and freed themselves from taxes. Ögedei decreed that nobles could appoint darughachi and judges in the appanages instead direct distribution without the permission of Great Khan thanks to genius Khitan minister Yelu Chucai. Kublai Khan continued Ögedei’s regulations somehow, however, both Güyük and Möngke restricted the autonomy of the appanages before. Ghazan also prohibited any misfeasance of appanage holders in Ilkhanate and Yuan councillor Temuder restricted Mongol nobles’ excessive rights on the appanages in China and Mongolia. Kublai’s successor and Khagan Temür abolished imperial son-in-law Goryeo King Chungnyeol‘s 358 departments which caused financial pressures to the Korean people, whose country was under the control of the Mongols. The five domestic animals most important in the Mongol Empire were horses (most important), cattle, camels, sheep, and goats. All of these animals were valued for their milk and all of the animals’ hides were used for clothing and shelter. Though often considered unattractive by other cultures, Mongolian domestic animals were well adapted to cold weather as well as shortages of food and water. These animals were and still are known to survive under these conditions while animals from other regions perish. Horses were by far the most important animal to the ancient Mongols. Not only were they fairly self-sufficient, but they were hardy and fast. Smaller than most, these animals could travel long distances without fatigue. They were also well adapted to the harsh winters and dug through the snow looking for grass to feed off of. Almost every family possessed at least one horse, and in some cases, horses were buried with their owners to serve with them in the next life. Mongolian horses were probably the most important factor of the Mongol Empire. Without the extremely skilled, not to mention famous, cavalry, the Mongols would not have been able to raid and capture the huge area they did and the Mongols would not be known, even today, as skilled horsemen. It also served as an animal that Mongols could drink blood from, by cutting into a vein in the neck and drinking it, especially on harsh, long rides from place to place. For additional sustenance, horse mare’s milk was made into an alcoholic beverage, known as airag. Horses allowed the Mongols to travel over twenty kilometers (13 miles) per hour which was great for ancient times. Cattle were used mainly as beasts of burden but they were also valued for their milk, though not as much so for their meat. They lived on the open range and were fairly easy to maintain. They were released early in the morning to graze without a herder or overseer and wandered back on their own in the afternoon. Though they were a part of the domestic animal population, they were not that common in the early empire. In the early time period, only nine percent of all domestic animals were cattle. Camels, along with cattle, were also used as beasts of burden. As they were domesticated (between 4000-3000 BC), they became one of the most important animals for land based trade in Asia. The reasons for this were that they did not require roads to travel on, they could carry up to 500 pounds of goods and supplies, and they did not require much water for long journeys. Besides being beasts of burden, camels’ hair was used as a main fiber in Mongolian textiles. Sheep and goats were most valued for their milk, meat, and wool. The wool of sheep in particular was very valuable. The shearing was usually done in the spring before the herds were moved to mountain pastures. Most importantly, it was used for making felt to insulate Mongolian homes, called gers, however it was also used for rugs, saddle blankets, and clothing. Ideal herd numbers were usually about 1000. To reach this quota, groups of people would combine their herds and travel together with their sheep and goats. Clothing of the Mongol nobles. During the Mongol Empire, there was a uniform type of Mongol dress though variations according to wealth, status, and gender did occur. These differences included the design, colour, cut, and elaborateness of the outfit. The first layer consisted of a long, ankle length robe called a caftan. Some caftans had a square collar but the majority overlapped in the front to fasten under the arm creating a slanting collar. The skirt of the caftan was sewn on separately, and sometimes ruffles were added depending on the purpose and class of the person wearing it. Men and unmarried women tied their caftans with two belts, one thin, leather one beneath a large, broad sash that covered the stomach. Once a woman became married, she stopped wearing the sash. Instead she wore a very full caftan and some had a short-sleeved jacket that opened in the front. For women of higher rank, the overlapping collar of their caftan was decorated with elaborate brocade and they wore full sleeves and a train that servants had to carry. For both genders, trousers were worn under the caftan probably because of the nomadic traditions of the Mongol people. The materials used to create caftans varied according to status and wealth. They ranged anywhere from silk, brocade, cotton, and valuable furs for richer groups, to leather, wool, and felt for those less well off. Season also dictated the type of fabric worn, especially for those that could afford it. In the summer, Middle Eastern silk and brocades were favored whereas in the winter furs were used to add additional warmth. During the Mongol Empire, people did not believe in washing their clothes, or themselves. They refrained from doing this because it was their belief that by washing, they would pollute the water and anger the dragons that controlled the water cycle. Therefore, clothes were often not changed until they fell off or fell apart, except for holidays when specialized robes were worn. Because of this, the smell of the outfit was seen as an important aspect of the wearer. For example, if the Great Khan were to give his previously worn clothing (with his smell on it) to a loyal subject, it would be considered a great honor to have not only the clothing, but the smell as well. Colour was also an important characteristic of clothing because it had symbolic meaning. During large festivities held by the Khan, he would give his important diplomats special robes to wear with specific colours according to what was being celebrated. These were worn only during the specific festival, and if one was caught wearing it at other times, punishments were extremely severe, as were the rules during the time of Khubilai Khan. From 1206 to 1405 the Mongol Empire displayed their military strength by conquering land between the Yellow Sea and the Eastern European border. This would not have been possible without their specialized horses, bows and arrows, and swords. They conquered numerous neighboring territories, which eventually led to history’s largest contiguous land-based empire. The Mongol Empire utilized the swiftness and strength of the horses to their advantage. Despite being only 12 to 13 hands high, the Mongols respected these small animals. At a young age, boys trained with the horses by hunting and herding with them. Eventually they became experienced riders, which prepared them for the military life that awaited them when they turned fifteen years old. Once these boys become soldiers, four to seven horses were given to them to alternate between. This large number of horses ensured that some were always rested and ready to fight. Because of this, a soldier had little excuse to fall behind in his tasks. Overall, the Mongol Society adored these animals because of their gentleness and loyalty to its master. Anyone who abused or neglected to feed these horses properly was subjected to punishment by the government. The Mongol Empire considered horses as an important factor to its success and tailored other weapons to them. The bow and arrow was created to be light enough to attack enemies while on horseback. The Mongols used composite bows made from birch, sinew and the horns of sheep. This made sturdy but light bows. Three types of arrows were created for different purposes. The most common arrow used for warfare was the pointed iron head, which could travel as far as 200 metres. If a soldier wanted to slice the flesh of the opposing member, the v-shaped point was used. In times of war, soldiers would shoot the third form of arrow with holes, used for signalling. By listening to the whistling sounds that were produced by this type of arrow, soldiers were able to march in a required direction. Soldiers primarily used horses and the bow and arrow in times of war, but the military took extra precautions. They prepared for any close range combat by supplying the soldiers with swords, axes, spears, and forks. Halberds, a pole with a two sided blade, were given to those of wealth and the remaining members of the military carried clubs or maces. Along with these necessities, the military provided their soldiers with leather sacks and files. The leather sacks were used to carry and keep items such as weapons dry. They also could be inflated and used as floats during river crossings. The files were for sharpening the arrows. If any soldier was found missing his weapons, he would be punished. Some punishment would be getting whipped, doing very hard physical activities, or possibly having to leave the army. The traditional Mongol family was patriarchal, patrilineal and patrivirilocal. Wives were brought for each of the sons, while daughters were married off to other clans. Wife-taking clans stood in a relation of inferiority to wife-giving clans. Thus wife-giving clans were considered “elder” or “bigger” in relation to wife-taking clans, who were considered “younger” or “smaller”. This distinction, symbolized in terms of “elder” and “younger” or “bigger” and “smaller”, was carried into the clan and family as well, and all members of a lineage were terminologically distinguished by generation and age, with senior superior to junior. After the family, the next largest social units were the subclan and clan. These units were derived from groups claiming patrilineal descent from a common ancestor, ranked in order of seniority (the “conical clan”). By the Chingissid era this ranking was symbolically expressed at formal feasts, in which tribal chieftains were seated and received particular portions of the slaughtered animal according to their status. The lineage structure of Central Asia had three different modes. It was organized on the basis of genealogical distance, or the proximity of individuals to one another on a graph of kinship; generational distance, or the rank of generation in relation to a common ancestor, and birth order, the rank of brothers in relation to each another. The paternal descent lines were collaterally ranked according to the birth of their founders, and were thus considered senior and junior to each other. Of the various collateral patrilines, the senior in order of descent from the founding ancestor, the line of eldest sons, was the most noble. In the steppe, no one had his exact equal; everyone found his place in a system of collaterally ranked lines of descent from a common ancestor. It was according to this idiom of superiority and inferiority of lineages derived from birth order that legal claims to superior rank were couched. Mongol kinship is one of a particular patrilineal type classed as Omaha kinship, in which relatives are grouped together under separate terms that crosscut generations, age, and even sexual difference. Thus, a man’s father’s sister’s children, his sister’s children, and his daughter’s children are all called by another term. A further attribute is strict terminological differentiation of siblings according to seniority. 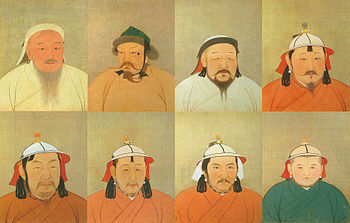 The division of Mongolian society into senior elite lineages and subordinate junior lineages was waning by the nineteenth century. During the 1920s the Communist regime was established. The remnants of the Mongolian aristocracy fought alongside the Japanese and against Chinese, Soviets and Communist Mongolians during World War II, but were defeated. There are some people today, though, who claim descent from the Mongol aristocracy. The anthropologist Herbert Harold Vreeland visited three Mongol communities in 1920 and published a highly detailed book with the results of his field work, “Mongol community and kinship structure”, now publicly available. Arghun’s wife was Buluqhan Khatun, who gave birth to Ghazan (here being breastfed). Rashid al-Din, early 14th century. Compared to other civilizations, Mongolian women had the power to influence society. Even though men were dominant in society, many turned to women in their lives for advice. While developing organizations within the Mongol Empire, Genghis Khan asked for assistance from his mother. He honored the advice women in his life offered. Genghis Khan permitted his wives to sit with him and encouraged them to voice their opinions. Because of their help, Genghis was able to choose his successor. The Mongols considered marriage as the passage into adulthood. Before a marriage could proceed, the bride’s family was required to offer “a dowry of clothing or household ornaments” to the groom’s mother. To avoid paying the dowry, families could exchange daughters or the groom could work for his future father-in-law. Once the dowry was settled, the bride’s family presented her with an inheritance of livestock or servants. Typically, married women of the Mongol Empire wore headdresses to distinguish themselves from the unmarried women. It is claimed that the Yassa/Zasag prohibited trade in women. Marriages in the Mongol Empire were arranged, however Chinggis Khan´s later nokoger (literally “women friends” but seen as wives usually and later) and those of his officers were not ever paid for with any bride price, but men were permitted to practice polygamy. Since each wife had their own yurt, the husband had the opportunity to choose where he wanted to sleep each night. Visitors to this region found it remarkable that marital complications did not arise. The location of the yurts between the wives differed depending on who married first. The first wife placed her yurt to the east and the other wives placed their yurts to the west. Even though a husband remained attached to his first wife, the women were “docile, diligent, and lacked jealousy” towards one another. After the husband had slept with one of his wives, the others congregated in her yurt to share drinks with the couple. The wives of the Mongol Empire were not bothered by the presence of the other women in their household. As a married woman, she displayed her “maturity and independence from her father” to society. The women devoted their lives to their daily tasks, which included physical work outside the household. Women worked by loading the yurts, herding and milking all the livestock, and making felt for the yurt. Along with these chores, they were expected to cook and sew for their husband, their children, and their elders. Mongol women enjoyed more freedoms than those in their foreign vassal countries. They refused to adopt the Chinese practice of footbinding and wear chadors or burqas. The Mongolian women were allowed to move about more freely in public. Toward the end of the Mongol Empire, however, the increasing influence of Neo-Confucianism, Buddhism and Islamicization saw greater limits placed on Mongol women. Mongols have been living in virtually the same dwellings since at least the 6th century AD. These dwellings are called gers, and during the Mongol Empire they consisted of a round, collapsible wooden frame covered in felt. The roof was formed from about 80 wooden rods attached at one end to the wall frame and at the other to an iron ring in the center, providing a sturdy base for the felt roof. Without the roof in place, this frame would have resembled a large wooden wheel with the wooden spokes converging at the iron ring. The top of the roof was usually about five feet higher than the walls so precipitation would run to the ground. The ring at the peak of the yurt could be left open as a vent for smoke and a window for sunlight, or it could be closed with a piece of felt. Doors were made from a felt flap or, for richer families, out of wood. The Turkish word for ger, “yurt”, means “homeland” in Turkish and it was probably never used to describe the tent. When the dwelling made its way to Mongolia, it adopted the name “ger” which means “home” in Mongolian. They were always set up with the door facing the south and tended to have an altar across from the door whether the inhabitant were Buddhist or shamanist. The floors were dirt, but richer families were able to cover the floors with felt rugs. Sometimes beds were used, but most people slept on the floor between hides, around the fire pit that was in the center of the dwelling. The first known yurt was seen engraved on a bronze bowl that was found in the Zagros Mountains of southern Iran, dating back to 600 BC, but the felt tent probably did not arrive in Mongolia for another thousand years. When the yurt did arrive, however, it quickly came into widespread use because of its ability to act in concert with the nomadic lifestyle of the Mongols. Most of the Mongol people were herders and moved constantly from southern regions in the winter months to the northern steppes in summer as well as moving periodically to fresh pastures. The yurts’ size and the felt walls made them relatively cool in the summers and warm in the winters allowing the Mongols to live in the same dwelling year-round. Disassembling the yurts only took about an hour, as did putting them back up in a new location. This is why there are still some doubts today about the assumption that the yurts have ever been really put on carts pulled by oxen for transporting them from camp to camp, without disassembling them, or if these carts are just a legend. Some travelers, like Marco Polo, did mention them in their writings: “They [the Mongols] have circular houses made of wood and covered with felt, which they carry about with them on four wheeled wagons wherever they go. For the framework of rods is so neatly constructed that it is light to carry.” (Polo, 97) Yurts could be heated with dried dung, found in abundance with the traveling herds, so no timber was needed. The felt for the covering was made from wool that was taken from sheep also present in most Mongol herds. The wooden frame was handed down from one generation to the next and seldom had to be replaced. Today, yurts follow the same basic design though they are usually covered in canvas, use an iron stove and stovepipe, and use a collapsible lattice work frame for the walls. They are still used in parts of rural China, central Mongolia, and by the Kyrgyz of Kyrgyzstan. Jump up ^ Ilkhanate broke up in 1335; the succession struggles of the Golden Horde and the Chagatai Khanate started in 1359 and 1340 respectively; the Yuan army fought against the Red Turban Rebellion since the 1350s. Jump up ^ BUELL, PAUL D. (1979). “SINO-KHITAN ADMINISTRATION IN MONGOL BUKHARA”. Journal of Asian History (Harrassowitz Verlag). Vol. 13 (No. 2): 137–8. JSTOR 41930343. Jump up ^ Atwood, Christopher P. “Food and Drink.” The Encyclopedia of The Mongols and the Mongol Empire. 1 vols. New York: Facts on File, 2004. Jump up ^ Allsen, Thomas T. Culture and Conquest in Mongol Eurasia. Cambridge: Cambridge UP, 2001. 177-179. Jump up ^ Amitai-Preiss, Reuven, and David O. Morgan, eds. The Mongol Empire and Its Legacy. Leiden: Brill, 1999. 200-222. Jump up ^ Atwood, Christopher P. “Paper Currency in the Mongol Empire.” The Encyclopedia of The Mongols and the Mongol Empire. 1 vols. New York: Facts on File, 2004. Jump up ^ Atwood, Christopher P. “Money in the Mongol Empire.” The Encyclopedia of The Mongols and the Mongol Empire. 1 vols. New York: Facts on File, 2004..
Jump up ^ A COMPENDIUM OF CHRONICLES: Rashid al-Din’s Illustrated History of the World (The Nasser D. Khalili Collection of Islamic Art, VOL XXVII) ISBN 0-19-727627-X or Reuven Amitai-Preiss (1995), Mongols and Mamluks: The Mamluk-Īlkhānid War, 1260-1281, p.p. 179-225. Cambridge University Press, ISBN 0-521-46226-6. Jump up ^ Atwood, Christopher P. “Cattle”. The Encyclopedia of Mongolia and the Mongol Empire. 1 vol. New York: Facts on File, 2004. Jump up ^ Polo, Marco. The Travels. Ed. Ronald Latham London: Penguin Books, 1598. Jump up ^ Atwood, Christopher P. “Sheep”. The Encyclopedia of Mongolia and the Mongol Empire. 1 vol. New York: Facts on File, 2004. Jump up ^ Allsen, Thomas T. Commodity and Trade in the Mongol Empire: A Cultural History of Islamic Textiles. Massachusetts. Cambridge University Press, 1997. Jump up ^ Atwood, Christopher P. “Clothing”. The Encyclopedia of Mongolia and the Mongol Empire. 1 vol. New York: Facts on File, 2004. Jump up ^ Atwood, Christopher P. “Footwear”. The Encyclopedia of Mongolia and the Mongol Empire. 1 vol. New York: Facts on File, 2004. Jump up ^ Atwood, Christopher P. “The Soldiers:Weaponry, Training, Rewards.” The Encyclopedia of Mongolia and the Mongol Empire. 1 vol. New York: Facts on File, 2004. ^ Jump up to: a b Howorth, Sir Henry H. History of the Mongols: Part IV. Taipei: Ch’eng Wen Publishing Company, 1970. ^ Jump up to: a b Hyer, Paul, and Sechin Jagchid. Mongolia’s Culture and Society. Boulder: Westview Press, 1979. ^ Jump up to: a b Lamb, Harold. The March of the Barbarians. New York: Doubleday, Doran & Company, Inc, 1940. Jump up ^ Phillips, E.D. Ancient Peoples and Places: The Mongols. 64 vols. London: Thames and Hudson, 1969. Jump up ^ “Justice And Jurisprudence”. Mypolice.ca. Retrieved 2014-02-14. Jump up ^ “Gender Roles and Women’s Status in Central Asia ans Anatolia between the Thirteenth and Sixteenth Centuries”. Etd.lib.metu.edu.tr. Retrieved 2014-02-14. Jump up ^ Agricultural and Pastoral Societies in Ancient and Classical History – Google Libros. Books.google.es. Retrieved 2014-02-14. Jump up ^ “Kinship Structure and Political Authority : The Middle East and Central Asia”. Psychologie.dev.czu.cz. Retrieved 2014-02-14. Jump up ^ “Mongol community and kinship structure. . – Full View | HathiTrust Digital Library | HathiTrust Digital Library”. Babel.hathitrust.org. 2012-12-05. Retrieved 2014-02-14. Jump up ^ Atwood, Christopher P. “The Mongol Empire.” The Encyclopedia of Mongolia and the Mongol Empire. 1 vol. New York: Facts on File, 2004. Jump up ^ Atwood, Christopher P. Encyclopedia of Mongolia and the Mongol Empire. New York: Facts on File, 2004. Jump up ^ Howorth, Henry H. History of the Mongols. Vol. 4. New York: Longmans, Green, and Co, 1927. Jump up ^ Polo, Marco. The Travels. Trans. Ronald Latham. Harmondsworth: Penguin Books, 1958. Jump up ^ tim scarlett. “Ulaantaij the finest yurts Mongolia produces – guaranteed”. Ulaantaij.com. Retrieved 2014-02-14.